Greetings again from the darkness. 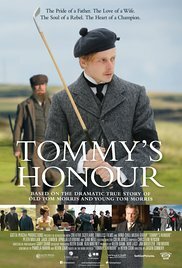 Jason Connery (Sean’s son) directs this story about old Tom Morris and his son Tommy (Young Tom), written by Pamela Martin from the book by Kevin Cook. It’s a bit surprising that the story focuses as much or more on the melodrama and personal story of the younger Tommy than the historical influences, but there is links action to give us a feel for the times. This entry was posted on Wednesday, April 19th, 2017 at 9:34 pm and is filed under Drama. You can follow any responses to this entry through the RSS 2.0 feed. You can leave a response, or trackback from your own site.